Personalized Tote Bags with Pockets Custom Embroidered or Printed in Bulk. Promotional, Inexpensive, sturdy 600D nylon. Budget Prices in the USA and Canada. Bulk custom imprinted or embroidered tote bags made of sturdy 600D polyester. 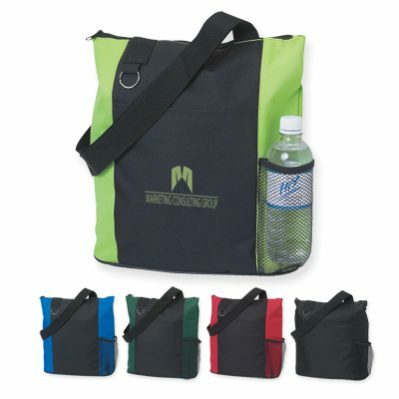 Our top quality tote bags are zippered and provided with a front pocket, a bottle mesh pocket and a split ring. We also supply wholesale blank (not imprinted) zippered totes. Budget Prices in America for wholesale personalized tote bags. American clients pay no taxes.